With Christmas in our sights, I’m sure buying and wrapping presents is top of your priority list at the moment, but have you considered getting anything for your horse? Even though they won’t understand what it’s for, it’s fun to include all the family in the festivities. Whether you just want a little something for them, or an even bigger buy, we have just the thing in our Christmas Shop. Likit Stud Muffins Christmas Pudding Treats – if your horse is a Stud Muffins fan already, then they’ll love these festive edition treats in delicious Christmas pudding flavour. Perfect as a stocking filler. Equilibrium Crunchits Gift Box – the ideal gift for all your horse-loving friends this Christmas, the Equilibrium Crunchits are low in sugar and calories, so can even be given to horses on a restricted diet. Hilton Herbs Herballs Christmas Edition – if you want a special treat for your horse but without the added sugars and calories, these healthy nuggets are a great solution. Packed with generous quantities of alfalfa, wheat flour, linseed, garlic and herbs, these are a tasty and nutritious reward. 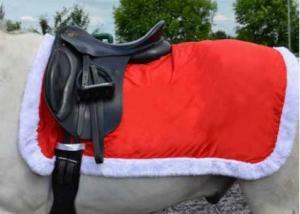 Hy Christmas Santa Exercise Sheet – more a gift for you than your horse, this fancy fur-trimmed exercise sheet is the perfect addition to any Christmas outing, as well as being fully functional. It is available in three different sizes to suit a range of ponies and horses. Likit Selection Box for Horses – bringing together some of the most popular snacks from the Likit range, including fruit snacks and treat bars, this Selection Box is a festive favourite and a real crowd-pleaser if you have more than one horse. HySHINE Brush Up for Christmas - treat your horse to a bit of a pamper with this collection of grooming goodies, including a body brush, dandy brush, face brush and hoof pick, as well as a bag of tasty Horse Bix snacks. A perfect gift for the first-time horse owner.